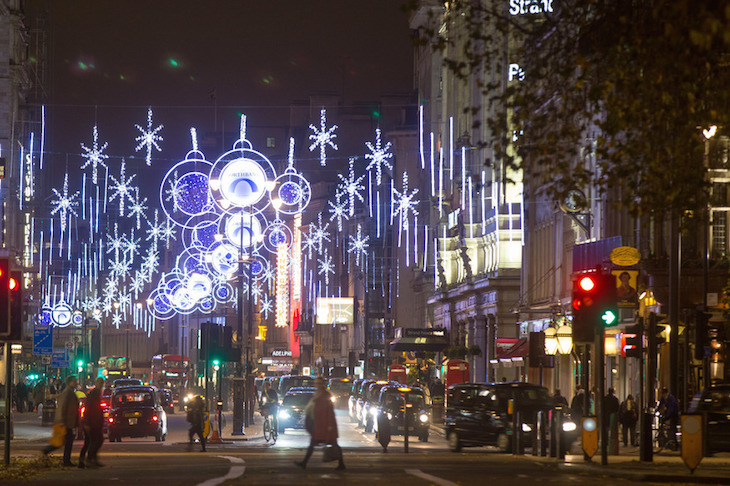 London's Christmas lights bring a little slice of magic to each festive season in the capital. They're one of the only things that makes hellish gift shopping in the West End bearable — and they're free! You can see them from street level as you weave among pedestrians whose heavy bags crash into you, and the frost bites at your ears. Or you can see a selection of the best from the warmth and comfort of a bus. Obviously a front seat on the top deck is ideal, but — because there are only four of them — difficult to obtain. To maximise your chances of getting that optimum view, avoid an evening rush hour trip. 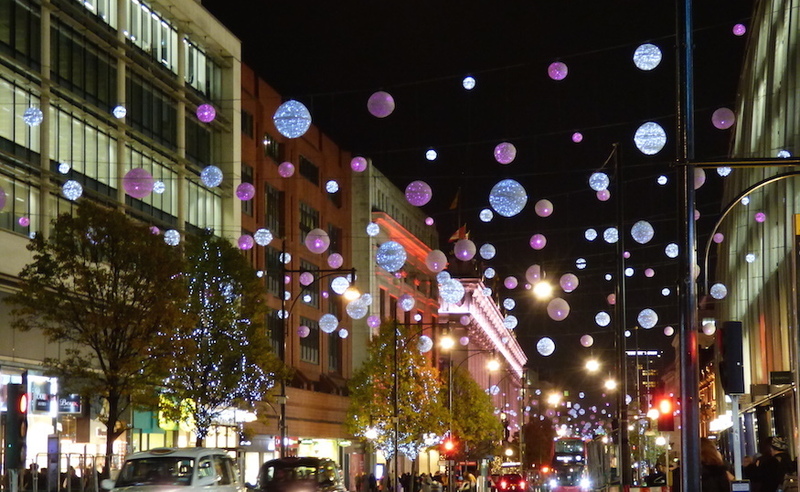 Oxford Street's small, bauble-style lights are the first ones you'll see. Plans for new lights for Oxford Street this year fell through (fingers crossed for 2019), but they have been given a new splash of purple. The 2018 switch on has already taken place, so visit any evening between now and January to see them in all their glory. As you zoom (or, y'know, crawl) down Oxford Street, keep an eye out for the peacock-themed New Bond Street lights on your right. You might only be able to catch a glimpse from the bus, so make use of the bus hopper fare. Pop off, have a quick mooch, before catching the next bus that comes along. 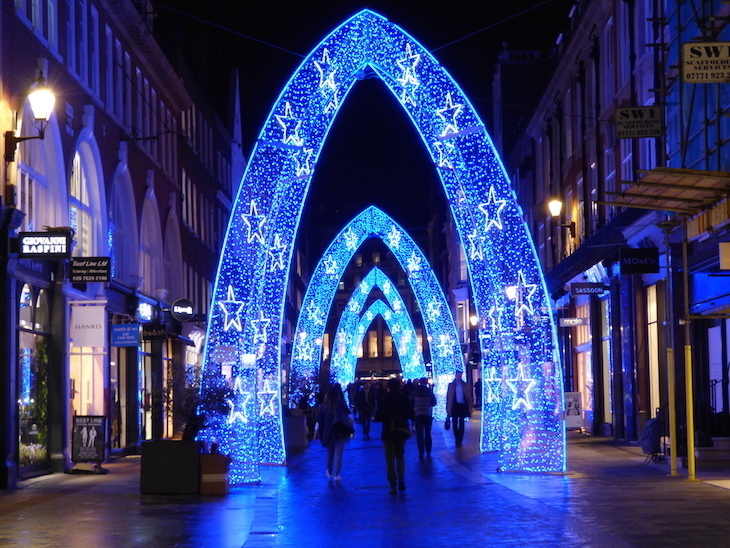 If you've time, it's worth walking a couple of minutes to see the South Molton Street lights too — the blue arches make for one heck of a selfie spot. Once you're back on the bus, you'll turn right onto Regent Street. For once, traffic is a bonus — if you get stuck at the junction for a while, the most colourful of the Oxford Street lights will be right in front of (and above) you. 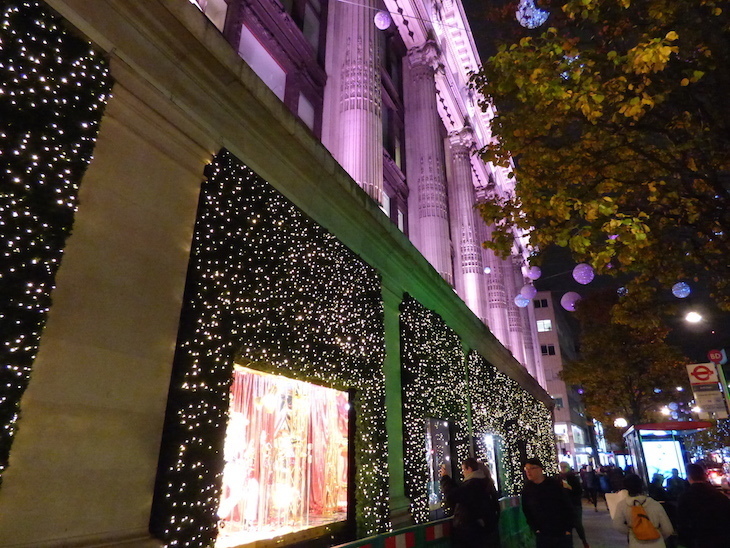 Regent Street is the land of luminescent angels. They glide gracefully in the air above you (or at least they will once they're switched on on Thursday 15 November) — if only buses had see-through roofs. The bus will heads down Regent Street, past those Hamleys Christmas windows towards Piccadilly Circus. As you roll through Piccadilly Circus, it's worth checking out those world-famous advertising boards. There's nothing especially Christmassy about them — though we'd be shocked if a lot of the ads weren't Christmas themed — but they had a revamp in 2017, offering an interesting update to a London icon. Next, if you're doing your journey after 6 December, check out the iconic Norwegian tree in Trafalgar Square. Hype yourself up for what is just a really big tree, by following its Twitter account, @trafalgartree. Don't raise your expectations too high though — every year people remark on how underwhelming the large tree draped in simple lights is. 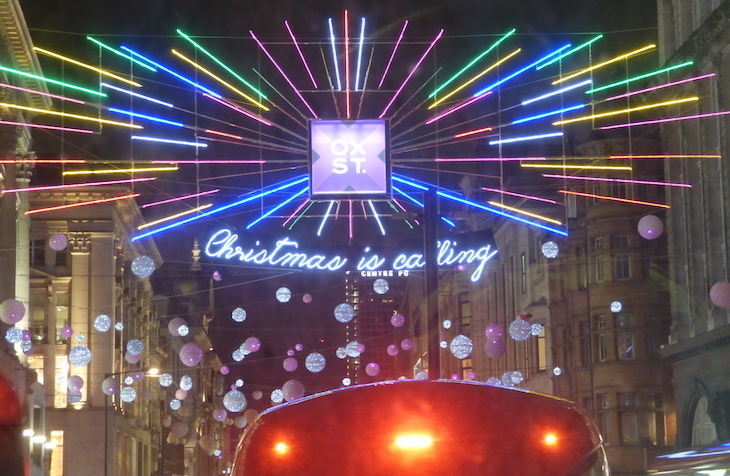 Now the bus turns onto Strand, giving you a chance to see the Northbank lights (from Wednesday 14 November 2018). Finally get off the bus around Aldwych, before the bus turns right and carries on down to Waterloo. From here, it's a short walk to the lights in Covent Garden (switch on: 13 November). 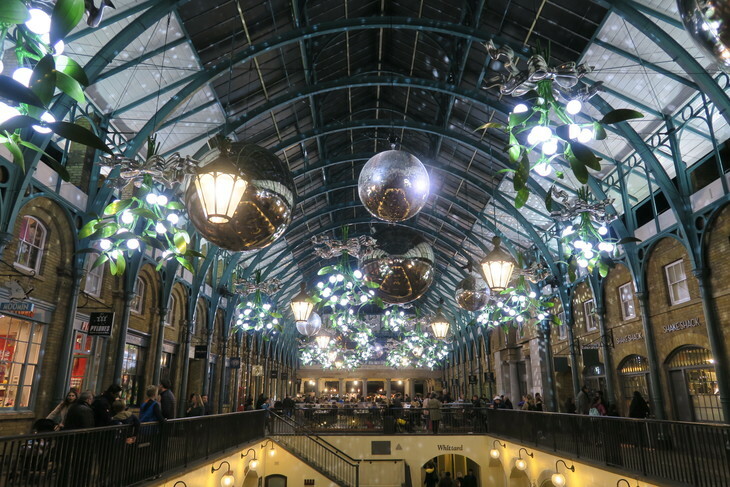 Those giant disco balls and hanging mistletoe decorations are back for this year, along with that giant sparkly reindeer, and plenty of Christmas trees dotted around the market and piazza. Alternatively, you could always skip Covent Garden and instead stay on the bus until Waterloo. From there make your way on foot to Southbank's Winter Market, where you can finish the evening with a steaming cup of mulled wine. Get the full lowdown on when every Christmas light display in London is switched on for 2018, and find other things to do in London at Christmas, including ice skating rinks, Christmas markets and Santa's grottos. If lights are your thing, you need to know about these dazzling light festivals taking place across the capital.